It took me a LONG time to find a good PCP office in this area and I am happy to havefinally found one! Both Dr. Akbary and Dr. Siobhani are great doctors they actually take time to listen to you and don't rush patients at all. The front desk staff area also super friendly. It took me a LONG time to find a good PCP office in this area and I am happy to have finally found one! Both Dr. Akbary and Dr. Siobhani aregreat doctors they actually take time to listen to you and don't rush patients at all. The front desk staff area also super friendly. Doctor Akbary was very pleasant, he explained thoroughly how each medication prescribed had certain side effects. Officewas very comfortable and clean. Office receptionists were very friendly and nice. Highly recommend as I’ve just made this my primary recently moving here from California. Doctor Akbary was very pleasant, he explained thoroughly how each medication prescribed had certain side effects. Office was very comfortable and clean. Office receptionists werevery friendly and nice. Highly recommend as I’ve just made this my primary recently moving here from California. ****PLEASE PROVIDE THE OFFICE WITH A 24 HOUR NOTICE FOR ANY CANCELLATIONS OR RESCHEDULES! **** Dr. Wasel Akbary is a board certified internal medicine and primary care physician with fellowship training in preventive medicine and geriatric medicine. He has a special interest in management of geriatric medicine, preventive medicine and diabetes. 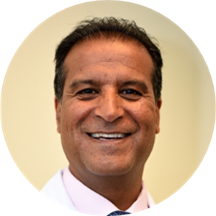 Most recently Dr. Akbary served as an internist with Inova Medical Group in Fairfax, VA. Prior to that he worked as an internist at Kaiser Permanente and as a hospitalist at Virginia Hospital Center. Dr. Akbary became interested in internal medicine because of his love for medicine and care for patients with a variety of challenges in disease process and management. His goal is to help his patients in understanding the disease process, enable them to care for themselves and to focus on preventive aspect of medicine. I am so thankful to Zocdoc for helping me find the best doctor. He was extremely patient friendly and spent around an hour with us discussing all the possibilities and made us comfortable. Even the technicians were awesome and supportive. Wewere so glad we found him. Would recommend him to all my friends over here. Thank you zocdoc. It was good. Dr. Akbary was nice and it was quick. However, I had booked an Annual Visit. I was not aware that I had to fast. I have to go back later on to run the tests because I ate.If I had known, I wouldn’t have eaten. It would have been great if either ZocDoc or the doctor’s office would have contacted me to let me know. Also, the office was not able to print my ZocDoc records so I had to redo the paperwork.